The Greendale Home Fashions Bistro Cushions feature two string ties to secure to chairs, and a center circle tack to secure foam cushioning in place without bunching or migrating. 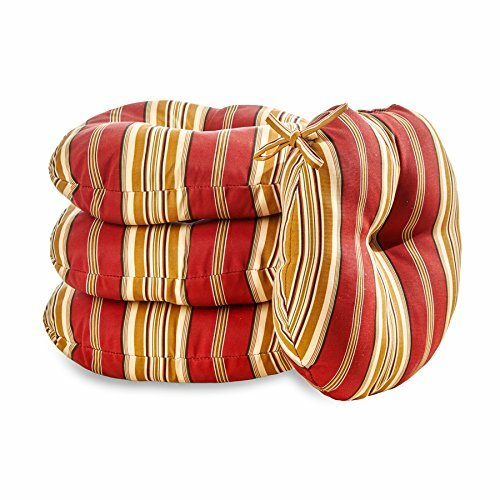 Each set includes four 18 inch round cushions made from a 100% polyester, UV coated material that is fade, stain and water resistant. The cushion's poly fiber fill is made from 100% recycled, post-consumer plastic bottles, and overstuffed for added comfort, strength and durability. A variety of modern prints are available. If you have any questions about this product by Greendale Home Fashions, contact us by completing and submitting the form below. If you are looking for a specif part number, please include it with your message. Set of 2 Indoor/Outdoor Throw Pillow 16" x 16" x 4" in Polyester Fabric Sky Medallion by Comfort Classics Inc.